One of the first things that head coach Jennifer O’Shea noticed about Danielle Moretti when she tried out for the girls’ basketball team as a freshman was that she was a good and tough defender. But perhaps even more than that, the coach thought Danielle shined because of her positive attitude, enthusiasm, work ethic, and how coachable she was. 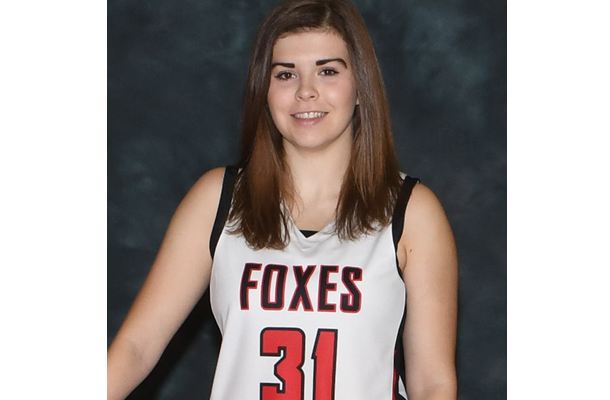 Those admirable qualities most likely were things she learned from her mother, grandfather, and aunt who all played basketball and passed down their passion for the game to Danielle, now a 5’7” senior guard for the Foxes. “I love the whole mentality of having to be focused at every part of the game and being part of a team,” explains Danielle, who, in addition to playing basketball, is a member of the National Honor Society, Ambassadors for Children Hospital, and the Fox Chapel Area High School Orchestra. Basketball first interested her in second grade. From there, she went on to play at Dorseyville Middle School, for the local recreation league, and in AAU leagues that traveled to tournaments throughout the area. But once she got to high school, Danielle discovered she had another passion in addition to basketball. She found great satisfaction from volunteering and decided she wanted to contribute more to her community, especially when it involved children. Additionally, Danielle is an ambassador for Children’s Hospital of UPMC, and in that capacity, gets involved in activities to raise funds that benefit children with very serious illnesses. Her genuine interest in children also has made her one of the most popular player-teachers at the youth clinics sponsored by the girls’ basketball team. The group offers them five to seven times a year for girls in third through eighth grades.